Our primary goal in our Virtual Franchise, every day, is to share our story as often as possible. Your story needs to be compelling. And it will be great if you've taken the trouble to write it down, refine it, shorten it and make sure it covers the head and the heart reasons why we love Juice Plus+ and what we do. They will remember your Story better than any facts about Juice Plus+. It's not so much about choosing the right words, as choosing the right people; effective stories communicate heart to heart, not head to head. You cannot say the wrong thing to the right person or the right thing to the wrong person. It's not about you, it's about them! After sharing your Story, always finish with a question, eg "Would you be open for more information?" or "Would you be interested in watching a video online, where you can learn from experts?" You will find these notes useful as you craft your story. Next, sit down with someone (eg. your coach, your sponsor) - in person or over the phone - and tell them the long version of your story. Your coach will take notes and then you both work on bringing out the most important points in the right order, with the right emphasis ... all in your own words, with tremendous enthusiasm. Ask your friends and family if you can practice on them! Continue to refine your story as you go. Remember - keep it short and full of heart. Armed with your compelling story, share it every day, at every opportunity, with everyone you meet, and you will be successful. 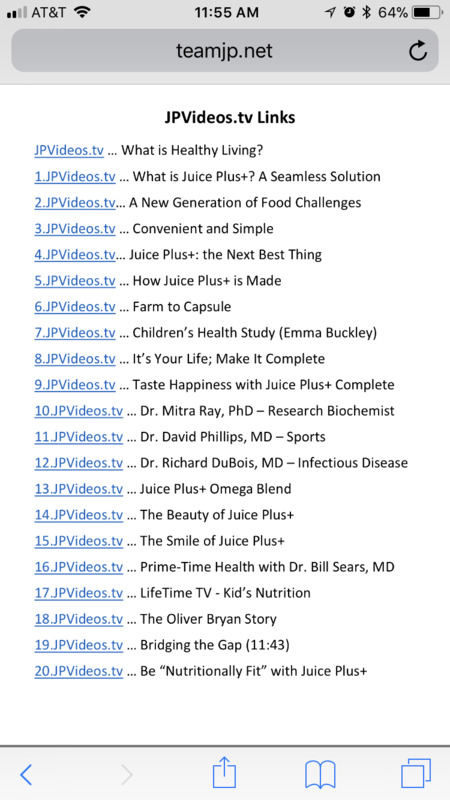 Enjoy some of the videos at JPVideos.tv; do any of them bring to mind someone you know who might love Juice Plus+? You can share these videos with them. It's as simple as asking "If I send you a link to a short video, would you watch it and let me know what you liked best about it?" JPVideos.tv is designed to be a one-stop-shop for all the best JP videos. The videos are numbered, so, if you know that the the Children's Health Study video is #7, so you can send them 7.JPVideos.tv. Keep this JPVideos Links document on your phone and copy/paste your chosen video link into a text. On an iPhone (it will be different on an android! ), open the document in Safari, then click on "Open in iBooks" (be quick before the option disappears). Then always open iBooks to find it again. 2. 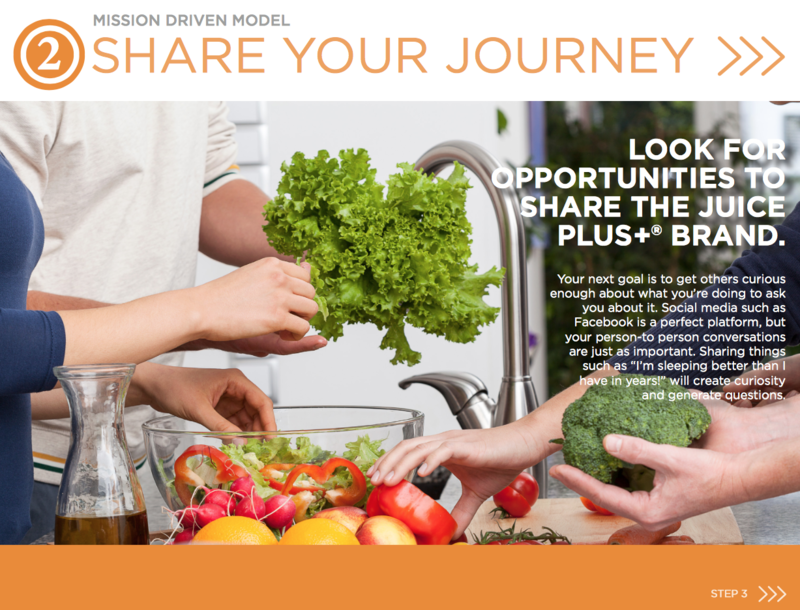 Be out and about among people, in conversations where the door will open for you to share Juice Plus+; be alert. Keep your Memory Jogger up to date. 3. Establish interest, by asking good questions and listening well; think T.I.N.Y. - make it about Their Interest Not Yours. 4. When the door opens, or if you feel compelled to share Juice Plus+ because you know that you have something they need ... then get right to the point and say "I may have something that will help..." and/or "I thought of you because..."
5. You can ask simple questions such as: "Are you interested in health and nutrition?" or "You look like someone who is interested in health and nutrition. Am I right?" "May I share with you something that I believe will help?" (to meet their need). 6. Decide which product meets their need (capsules, chewables, Complete, bars, Tower Garden). If they need to make money more than spend money, share your WHY (your vision for this business). 1. Share your story. It should raise their curiosity enough for them to want to know more. 4. Make an appointment to follow up (a specific day and time, soon, and a number to call them on). Ask them to get started (to become a Juice Plus+ Preferred Customer). If 'yes', sign them up, just as you did yourself. Use the Customer Profile with your new customer - a vital tool. Then plan to make them into a Raving Fan; discuss this with your sponsor - customer care is vital! Follow this tried and proven system and you will add customer after customer - we never stop sharing and enrolling. Keep doing this until you have a Qualified Business (eg. with 25 JP+ Trio customers producing 1000 pvc points each month). Then just keep on sharing and adding ... and creating Raving Fan Customers - they are worth their weight in gold: from them come your best Team Members! Over time, solidify your business by producing more than 1,000 points each month from your own base of approximately 30-40 Preferred Customer families - here's why this "Customer-Self-Qualifying" is so important. Once you are Customer Qualified you are Ready for Your Next Promotion!